The St. Louis Republic, Dec 6, 1900, Page 9. 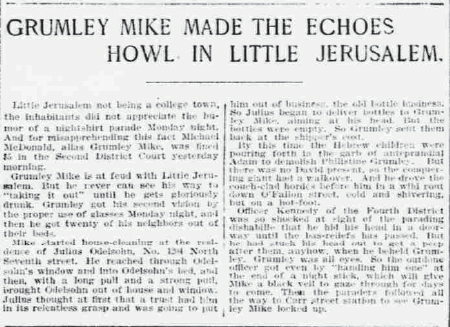 Little Jerusalem not being a college town, the inhabitants did not appreciate the humor of a nightshirt parade Monday night. And for misapprehending the fact Michael McDonald, alias Grumley Mike, was fined $5 in the Second District Court yesterday morning. 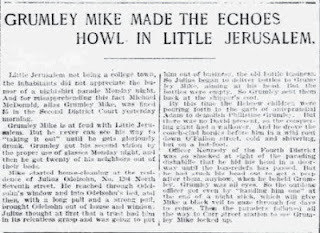 Grumley Mike is at feud with Little Jerusalem. But he never can see his way to “taking it out” until he gets gloriously drunk. Grumley got his second vision by the proper use of glasses Monday night, and then he got twenty of his neighbors out of their beds. Mike started house-cleaning at the residence of Julius Odelsohn, No. 124 North Seventh street. He reached through Odelsohn’s window and into Odelsohn’s bed, and then, with a long pull and a strong pull, brought Odelsohn out of house and window. Julius thought at first that a trust had him in its relentless grasp and was going to put him out of business, the old bottle business. So Julius began to deliver bottles to Grumley Mike, aiming at his head. But the bottles were empty. So Grumley sent them back at the shipper’s cost. By this time the Hebrew children were pouring forth in the garb of anteprandial Adam to demolish Philistine Grumley. But there was no David present, so the conquering giant had a walkover. And he drove the couch-clad hordes before him in a wild rout down O’Fallon street, cold and shivering, but on a hot-foot. Officer Kennedy of the Fourth District was so shocked at sight of the parading dishabille that he hid his head in a doorway until the bas-reliefs had passed. But he had stuck his head out to get a peep after them anyhow, when he beheld Grumley. Grumley was all eyes. So the outdone officer got even by “handing him one” at the end of a night stick, which will give Mike a black veil to gaze through for days to come. Then the paraders followed all the way to Carr street station to see Grumley Mike locked up. Dec 11, 1897 St. Louis Post Dispatch, page 2: Michael McDonald, alias "Grumley Mike," alleged to be one of the hardest characters in the Fourth District, was sent to the Work-House on a $25 fine Saturday for idling. So idling (or loitering) yielded a $25 fine and a trip to the work-house. An evening 'house-cleaning' only resulted in a $5 fine and perhaps a night in jail. 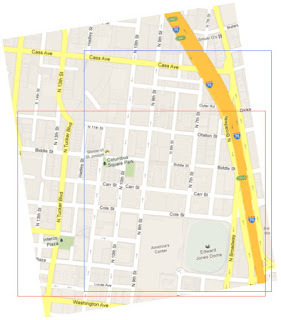 3) One newspaper article defines the borders of Little Jerusalem as Sixth street, Eleventh street, Cass avenue, and Lucas avenue. This intersects with the Carr Square neighborhood tenements I've written about in the past. 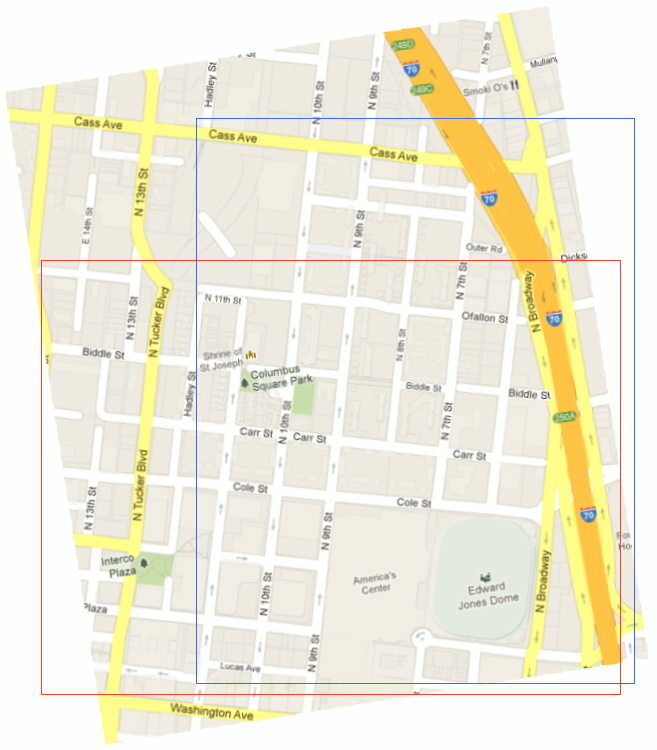 Its borders were Seventh street, Fourteenth street, OFallon avenue, and Lucas avenue. The map to the left illustrates the area today.